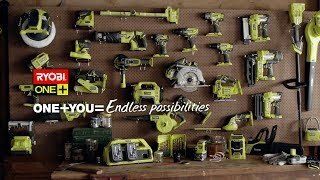 Experience the ultimate combination of power, sophistication and ease with the RYOBI ONE+ brushless reciprocating saw. Every element of this cordless unit has been perfected for an elite user experience. The blade current adapts to the material, optimising your overall cutting performance. This performance is easier to see and guide thanks to the unit’s dust blower. For bigger jobs, the Anti-Vibe handle keeps your hand and arm fatigue-free. 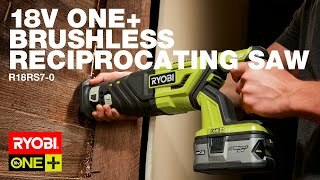 The brushless motor perfectly complements the RYOBI ONE+ technology. With less wear on the motor, each battery delivers greater power with longer runtime. You also have the option of RYOBI’s High Power ONE+ batteries for the ultimate power and performance. The recip saw makes maintenance easier than ever. The stay-open blade clamp means you can simply replace blades one-handed. The on-board wrench storage means shoes can be replaced in a flash. The RYOBI 18V ONE+ brushless recip saw is the most complete saw on the market. 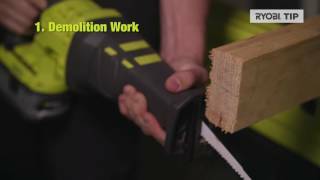 Grab your RYOBI ONE+ brushless reciprocating saw from your local Bunnings Warehouse today.